Get creative with your protein sources this week and try these three tasty meals with beef, chicken, and tofu! Make the beef dish on Sunday because it takes the longest to cook. 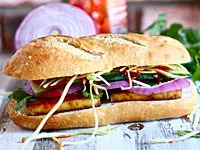 Then, all week long enjoy the leftovers while making quick and easy cajun chicken pasta and Vietnamese tofu sandwiches (Banh Mi). If possible, buy local, organic meat and non-GMO tofu. This classic French dish is perfect for January! Leftovers taste even better the next day. 1. Combine the flour, 1 tsp. salt and pepper in a large Ziploc bag and then add the beef and shake well so all the beef has been covered by the flour. 2. Heat 1 tbsp. oil and butter in a large cast iron (or heavy bottomed) pan over medium high heat. Once the butter has melted and is sizzling, add the beef and cook for about 4 minutes per side, until just browned. Remove beef and place on a plate. 3. In a large pot, heat the other tablespoon of oil over medium heat. Once hot, add the onions, carrots and celery. Sprinkle vegetables with a pinch of salt and sauté for ten minutes (adding the minced garlic after five minutes) until onion is translucent and carrots have started to become tender. Add the minced thyme and stir to combine. 4. Add the beef to the vegetables along with the wine and bay leaf. Bring to a boil, then reduce to a slow simmer and partially cover pot, leaving about one half of an inch open. 5. Slowly simmer beef for three hours. 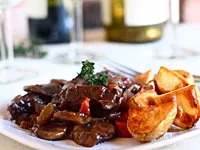 After three hours, the wine should have reduced to a thick, velvety sauce and the beef should be very tender. Season with the additional teaspoon of salt and a pinch of black pepper. 6. Near the end of the simmering process, heat the remaining tablespoon of oil in a sauté pan. Add the mushrooms and a pinch of salt, and sauté for ten minutes until tender. Stir cooked mushrooms into beef at the very end. Introduce your family to new, fresh tastes with these easy to throw together sandwiches! Leftover baked tofu makes a great dinner alongside a sweet potato and some winter greens. 1. Preheat oven to 400 degrees and cover a sheet tray with tin foil and spray with cooking spray. 2. In a large dish, whisk together the tamari, sesame oil, rice vinegar, ginger, salt, red pepper flakes and maple syrup. Slice tofu into thin (1/4 inch) slices and drench in sauce. Lay each piece of tofu flat on the tin foil then bake for 30 minutes, flipping each slice halfway through. 3. After tofu has been baked, prepare sandwiches. Slice baguettes and smear half lightly with mayonnaise. Lay two slices of tofu on top of mayonnaise-covered bread, then spread sriracha sauce directly on tofu followed by a little sweet chili sauce. Layer on torn cilantro, broccoli slaw, thin slices of onion and cucumber, followed by another dab of sriracha (depending on how spicy you like it!). 4. Serve sandwiches with additional sweet chili sauce and/or sriracha sauce on the side. 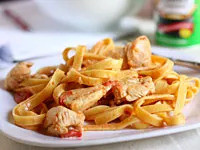 This "creamy" pasta dish only uses a small amount of cream to keep calories low without sacrificing any flavor! 1. Cook pasta in boiling, lightly salted water. Drain and set aside. 2. In a large skillet, heat the olive oil over medium high heat. Add the chicken and 1 tsp. cajun seasoning and cook until the chicken has just cooked through—about six minutes. 3. Transfer the cooked chicken to a plate, and add the minced shallot and garlic to the hot skillet (add a little more oil if necessary). Saute until the shallot is tender and then add the tomatoes, cream, and additional cajun seasoning. Bring to a simmer and cook, stirring frequently, for a couple minutes. Add chicken back to sauce.